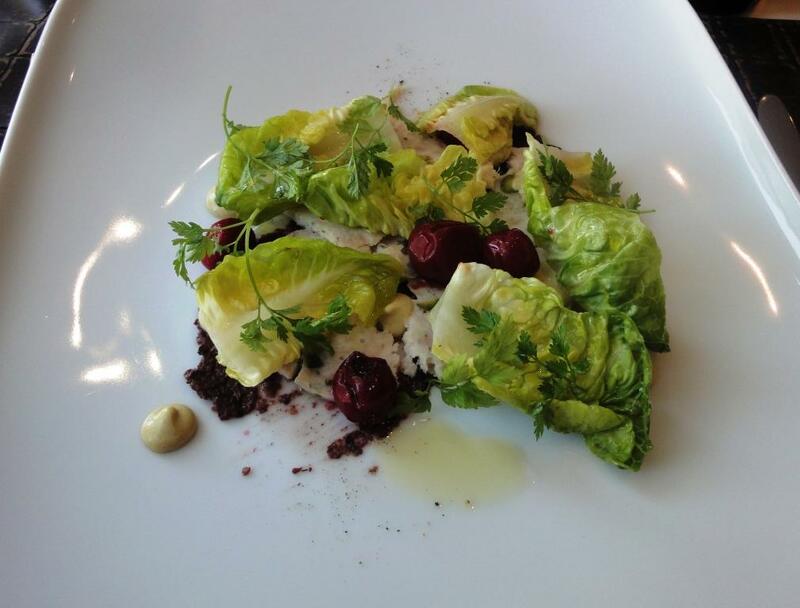 Michelin star restaurants in Helsinki 2014 – two new stars! Michelin Guide announced updated list of Michelin starred restaurants on 12th March. We have two new 1 Michelin star restaurants in Helsinki! Ask and Chef & Sommelier got their first Michelin stars today! Another big news last year was that 2 Michelin star restaurant Chez Dominique closed down it’s doors. 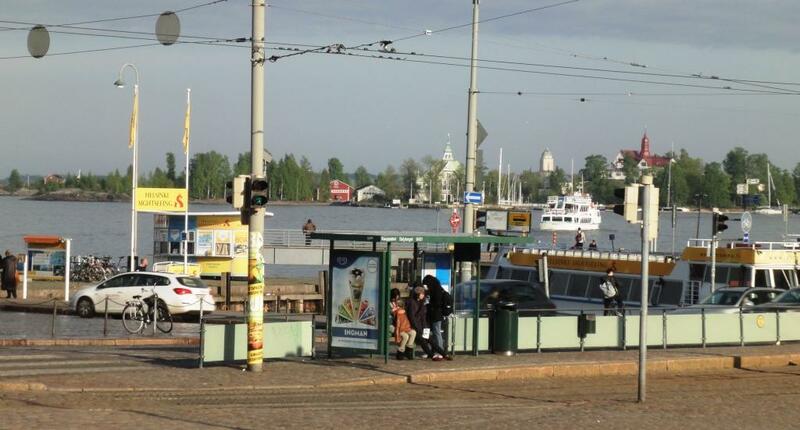 Means that there are no 2 or 3 star restaurants in Finland or Helsinki. One and only 2 Michelin star restaurant in Finland and Helsinki, Chez Dominique, shuts down on the 5th October! Chef Hans Välimäki explains that closing the restaurant is temporary and Chez Dominique will make a comeback someday. Hopefully so, but unlikely! It must have been close to get third Michelin star. 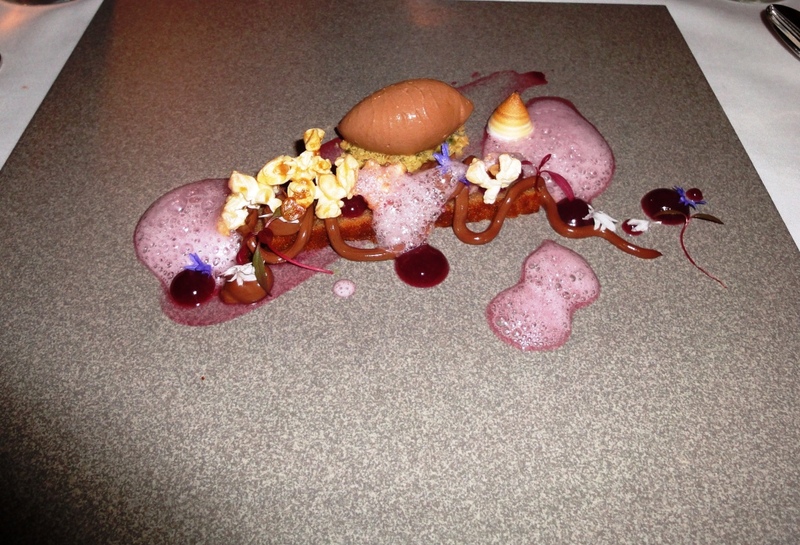 After closing there are four 1 Michelin star restaurants in Helsinki: Demo, Luomo, Olo and Postres. Hopefully we do not see similar trend with these. If you want to visit in Hans Välimäki restaurant, Midhill is your choice. Restaurant serves gourmet hamburgers and is located in the same shopping and restaurant area as Hard Rock Cafe. Etsin uutta inspiraatiota Chez Dominique tulevaisuudesta koko kuluneen kesän ja se löytyikin. Päätös on nyt tehty: voin ilolla ja YLPEYDELLÄ ilmoittaa, että ravintola Chez Dominique vetäytyy 5.10.2013 jälkeen määräämättömäksi ajaksi tauolle. Olemme auki koko syyskuun neljännestä päivästä lukien 5.10.2013 saakka. Ravintolan loppuhuipennuksessa vetovastuun keittiöstä ottavat CD:n nuoret kasvatit Eric Räty ja Toni Toivanen. Odotettavissa onkin jotain täysin uutta ja yllättävää, josta ei kannata jäädä paitsi. Olen viettänyt viimeiset 15 vuotta enempi tai vähempi Chez Dominiquen keittiössä, ja saanut todellista lähituntumaa suomalaiseen gastronomiaan. Kehitys on ollut huimaa, ja kokit ovat Suomessa tällä hetkellä parempia kuin koskaan. Samat sanat salin ammattilaisista. 15 vuotta vilahti nopeasti. CD:ssä on koettu useita huippuhetkiä milloin erilaisten saavutusten kautta, milloin on juhlittu uusien tekniikoiden oppimista tai kilistelty vaikkapa vain loman alkamisen kunniaksi. Kivaa on ollut, parhaimmillaan superkivaa. Olen ylpeä Dominiquesta ja kaikesta siitä, mitä olen upean henkilökuntani kanssa saavuttanut, mutta nyt on aika tehdä muuta. Keittämisessä en taukoa pidä. Rakastan keittämistä, ja aion vedellä vedellä isosti ja komeasti täysin uusien haasteiden parissa! Niistä sitten myöhemmin. Kiitos, kumarrus ja tuduluu kaikille Chez Dominiquessa viihtyneille. Nähdään ainakin Midhillissä ja kuten aiemmin mainitsin, niin muutakin on tulossa. Chez Dominique palaa vielä. Aika näyttää miten, missä ja milloin. Sasso, we have dined there before reform, but never have had so conflicting opinions as we had this time. Royal Restaurants Ltd make up one of Finland’s largest private enterprise in the restaurant field with 27 restaurants in 21 locations. 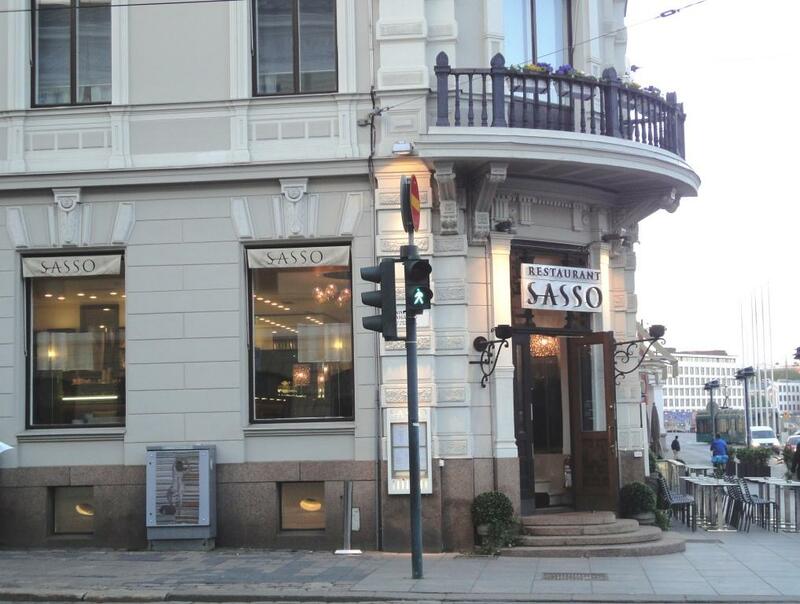 One of them is North Italian kitchen restaurant Sasso which Palace-Kamp Group sold to Royal Restaurants early 2013. After restoration Sasso was re-opened on 1st of May for May Day lunch. 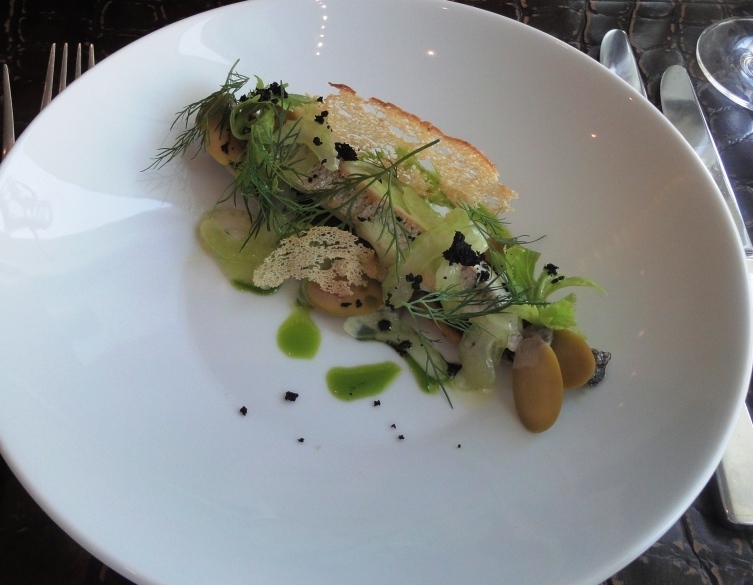 Sasso chef Eero Vottonen, chef of the year 2012, was hired from Michelin restaurant Luomo. Ambitious objectives for the kitchen, obviously. 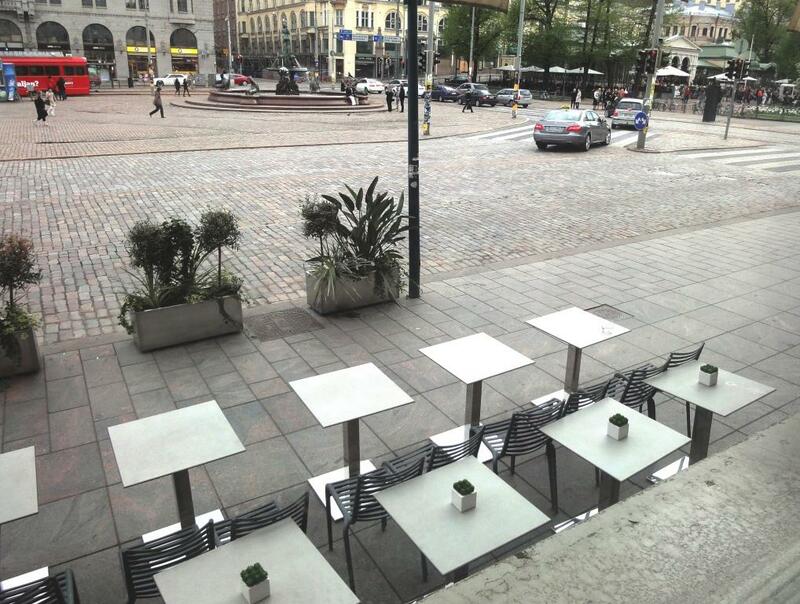 Restaurant and its widened terrace are located in Pohjoisesplanadi 17 in Torikorttelit. Restaurant Fishmarket downstairs has same address. Dinner started with Campari sodas and some bread. Butter or margarine had really salty olive groats on it. For starters ordered Mortadella di coniglio con ciliegie e pistacchio and Spigola marinata con olive verdi e basilico. Rabbit was confusing because of bitter cherries and salty olive paste, it did not taste at all. Seabass was great, it was ripe although waiter said it would be raw. This portion could also be main course if bigger with new crop potatoes. For main courses had Salmone all’olio di oliva con carciofi e limone and Vitello ai ferri con asparaghi e pomodori. Again fish was well prepared and tasty. 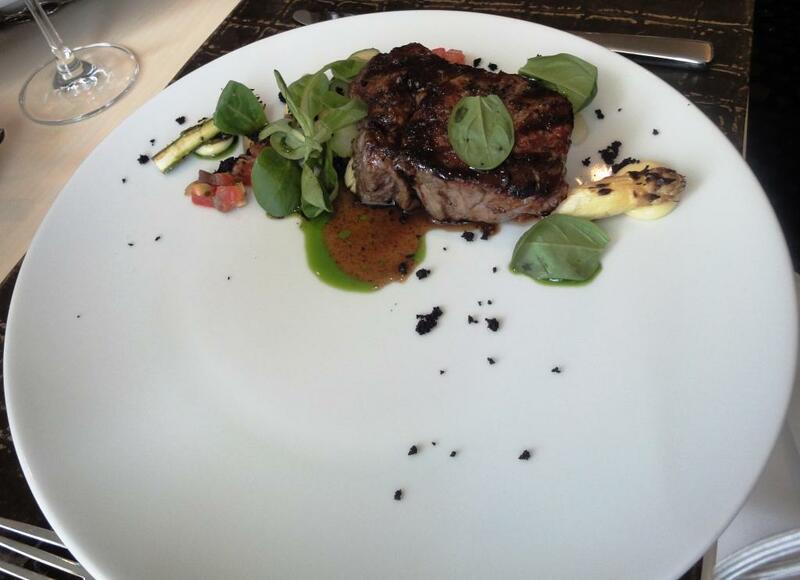 See the position of veal, is the new trend to place food on the other side of plate? Did something forgot from the plate? Veal was like entrecote, too greasy. Because of small portions we had plenty of space for desserts; Tiramisu and Rabarbero all’arancia con latte di mandorle. 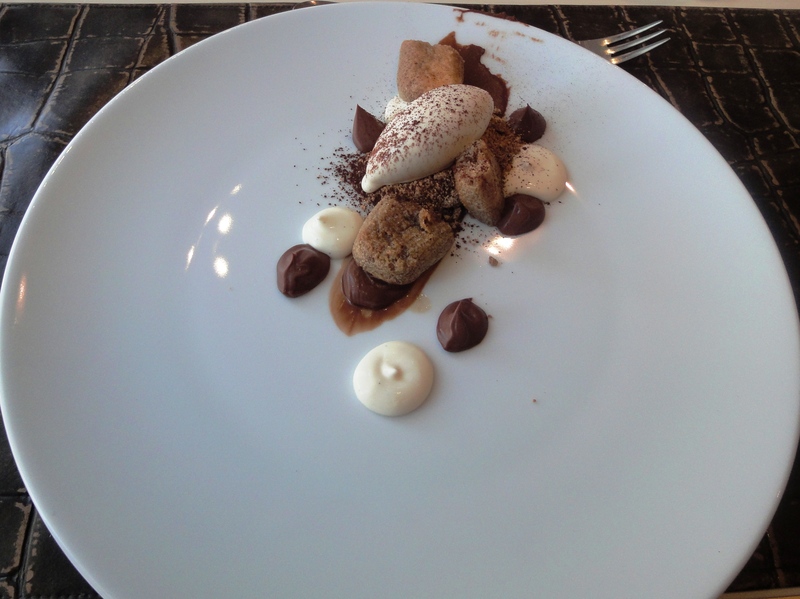 Tiramisu was a relief for meat course, delicious and sweet with soft biscuits. Again, see the new trend in placing the food on plate! Almond milk was replaced with sorbet because of milk. Remember that in Spain we got almond milk without cow’s milk. Because of totally different views we had to judge meals (meat and fish) separately. Overall grade is 4 because of location and window table we had; opportunity to watch Havis Amanda statue and Market Square. WInes are mainly Italian but moderately priced. Got first too warm white wine which was replaced without asking, polite gesture. Michelin Guide has updated it’s list of rewarded restaurants. All 5 existing Michelin restaurants kept their stars, so no new Michelin restaurants in Finland or Helsinki. G.W. Sundmans might be rewarded soon as it has been highlighted with red letters meaning “rising star”. Restaurant has had 1 Michelin star several years ago. Chez Dominique, Rikhardinkatu 4, Helsinki: 2 stars (owner Hans Välimäki) http://www.chezdominique.fi/home_cd2? Interesting is that Farang and Gaijin still both have Bid Gourmand (excellent price/quality ratio) logos; both owned by chefs Tomi Björk and Matti Wiberg. Farang has opened restuarant in Stockholm, must find out the rating. Also interesting is that Grotesk, owned by same chefs as Demo, kept Bid Gourmand logo although it changed it’s style. Update: did not remember to write that PureBistro is owned by Luomu owners! One Michelin star restaurant and one Bib Gourmand restaurant. However, when we vistited PureBistro, we were not so happy about the food. Only Michelin 1 star restaurant missing from TOP 10 is restaurant Postres. PureBistro is a modern bistro and bar at the Market Square in Torikorttelit area. Restaurant serves uncomplicated but handmade and modern bistro food. 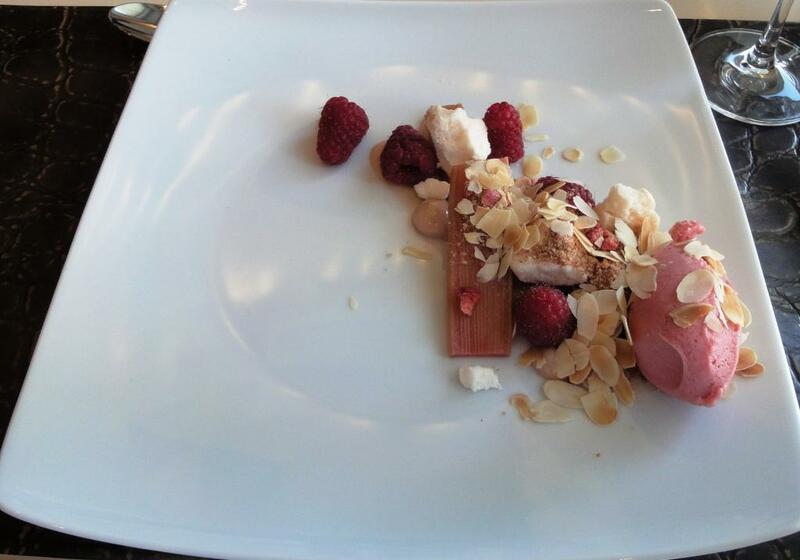 PureBistro is owned by Michelin star restaurant Luomo chef”s Jouni Toivanen and Mika Mattila. Dining room is quite small as well as tables. Ask for window table and you can enjoy sea view and watch what happens at Market Square. At 8PM restaurant was full and you could mostly hear english and swedish; well marketed to hotels or travel agencies. As the core value is fresh materials, the menu is short, but there is changing daily specials available. There might be for example a whole bird, fish or shellfish to be shared. This time restaurant had lamb as daily speciality. If it would still be summer you could enjoy lunch or dinner at one of the terraces. Fresh bread is served in paper bag with caramelized butter. Unfortunately butterscotch taste did not match so well with white bread served, maybe it would have with rye bread. Three courses cost 44€, if you order dishes separately bill would be 50€. During this visit prices were a little bit high compared to the level of portions. For starters ordered SKAGEN and DUCK IN JAPAN. 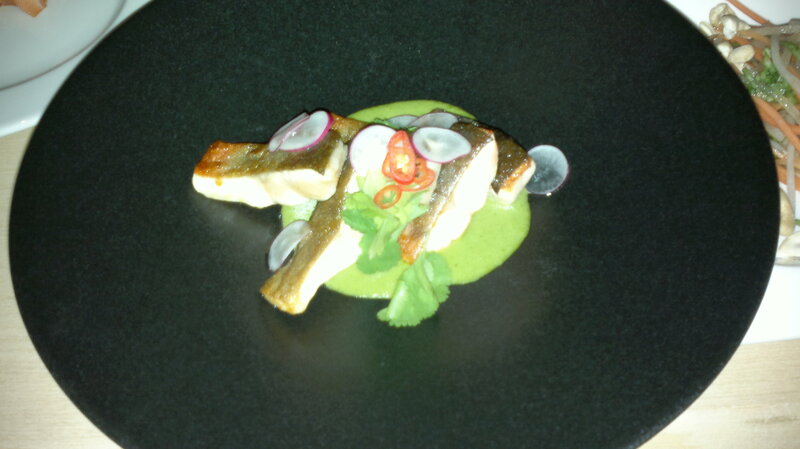 Skagen included brioche, shrimps, whitefish roe and chili mayonnaise. Not so typical brioche and chili could have tasted more. Duck in Japan was duck leg and foie terrine, bacon dashi and miso mayonnaise. Terrine was really delicious but could not found the taste of Japan. For main courses ordered daily speciality LAMB MOROCCO STYLE and SALMON CONFIT ‘APIACEAE’. Lamb was too greasy and without taste of Morocco. 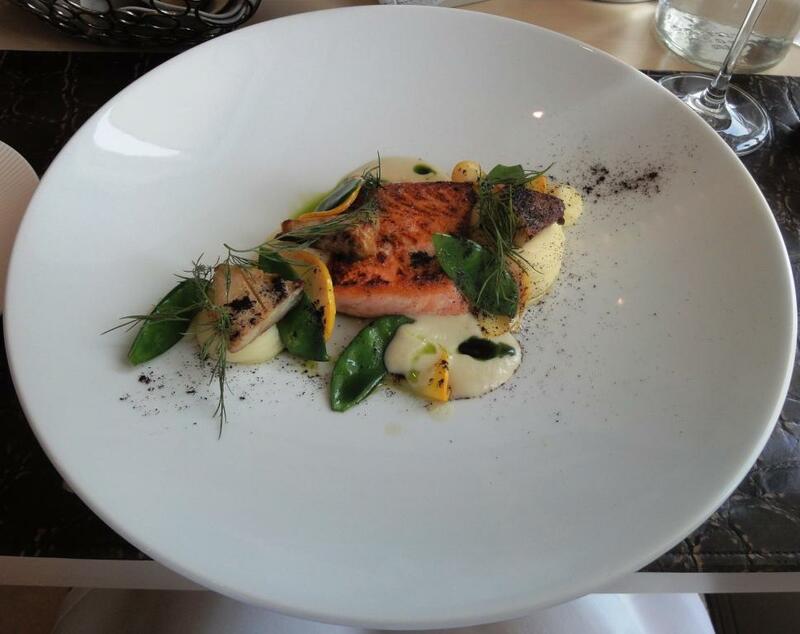 Salmon was stewed in olive oil and should include set of flowers. Fish was stewed perfectly as it was still partly red inside but set of flowers remains mystery. As pyre was asked to left out oufit was close to soup but no spoon available. For dessert had QUEEN rasperry and blueberry and BANANA SPLIT. “Queen” was fresh but more like a juice. Banana Split was daily speciality but quite ordinary dessert. Suggest to order from a la carte list instead of daily speciality. Hope PureBistro uses more spices because oriental names of the dishes make believe they are well flavoured. 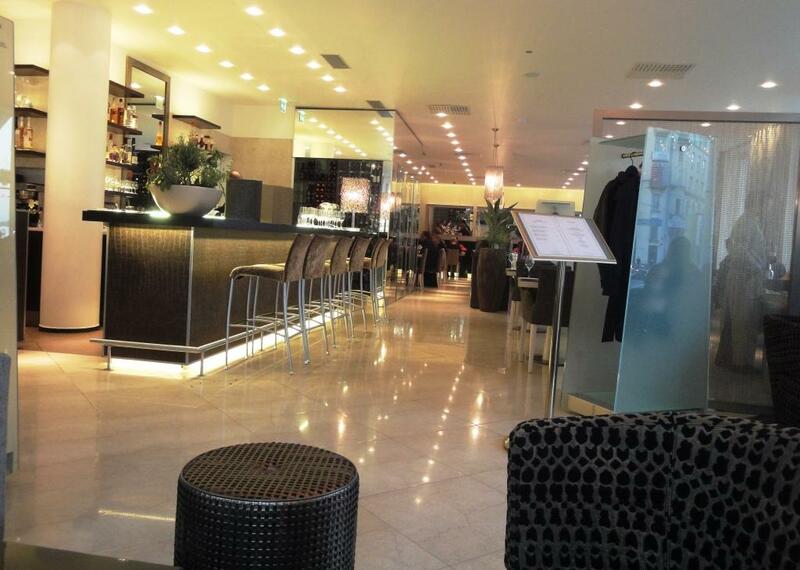 However, the location is perfect and athmosphere casual for chatting groups. Michelin Guide has updated it’s list of rewarded restaurants. All 5 existing Michelin restaurants kept their stars Chez Dominique in lead with 2 stars. We hoped that Chez Dominique would earn third star, but unfortunately not. Work or even food art of Hans Välimäki would have been worth of it. Interesting is that Farang and Gaijin have now both Bid Gourmand (excellent price/quality ratio) logos; both owned by chefs Tomi Björk and Matti Wiberg. Also interesting is that Grotesk, owned by same chefs as Demo, got Bid Gourmand logo. First time same owners have two restaurants in Michelin Guide.